I was watching Party of Five last week. Party of Five is a show I grew up with and has a special place in my heart (and I promise this won't be the last time I blog about POF) and Zone Romantica just started showing the second series and last week we're up to the episode where Charlie and Kirsten decide to elope to Reno to save the wedding chaos and sneak off leaving only a note. The rest of the Salingers are all upset that Charlie did something so selfish as to not include them in such a huge moment in their lives but Charlie and Kirsten come back having not gotten married. Charlie makes this great speech about how his 'dearly beloved' weren't there, so they couldn't go through with the ceremony. And watching that scene sparked this memory that I hadn't thought about in years. I was 10 and sitting in the car with my older brother, and for some reason my dad decided to take us on a road trip to Reno. (Do you know where this is headed?) The family hadn't been getting along too well before this, there always felt like some underlying tension that kept everyone on edge. Anyway, there I am sitting in the car, we're parked somewhere next to tall buildings in Reno and my brother is getting on my nerves trying to wind me up and I think I have a book with me though I'd never be able to tell you which one it is now. I can't remember what time of year it is or if anything happened before this or after this, all I remember is this one moment. Sitting in the car while my parents run into a building for half an hour? 45 minutes? It's a big moment, I just don't realise the significance yet. In fact, I don't remember the rest. Do they tell us right away that they just got married? Do they wait and tell us later outside of the car? I don't remember. 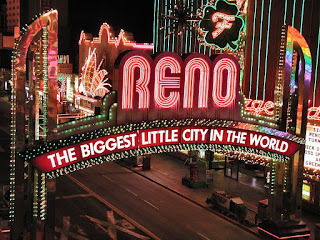 All I know is that we as a family drove to Reno together, but only my parents went into that building. They left us out. We were not included in their wedding. It probably wasn't meant to be malicious. I don't believe at all that we weren't considered 'dearly beloved' and at the time it didn't even occur to me to be upset or sad or annoyed or to even ask the question. You know, why did they leave us in the car? Why didn't they bring us in with them? Why weren't we included? Why didn't they tell us beforehand? I wasn't hoping for a bridesmaid's dress or anything, I'm just upset that I didn't have this one memory of them getting married. I'd have liked to have been there. Was it a happy occasion? Did either of them smile while going through the motions? What was the thought process that went on for this to happen? Why? My hubby and I eloped without telling the kids, either. In our case, we were scared to death at what their reactions would be. Silly now, looking back on it. But it just seemed to make sense at the time. Love screws up logical thinking. LOL! thats so sad... were kids allowed??? Greenjello - were your kids upset when they found out or were they just happy that you were happy? Misty - I'm not sure, if that was the case, that we weren't allowed to come in, I'd have loved it if someone had told me that. For there to be a logical explanation would change everything! A little of both. His kids were more unhappy than mine were.